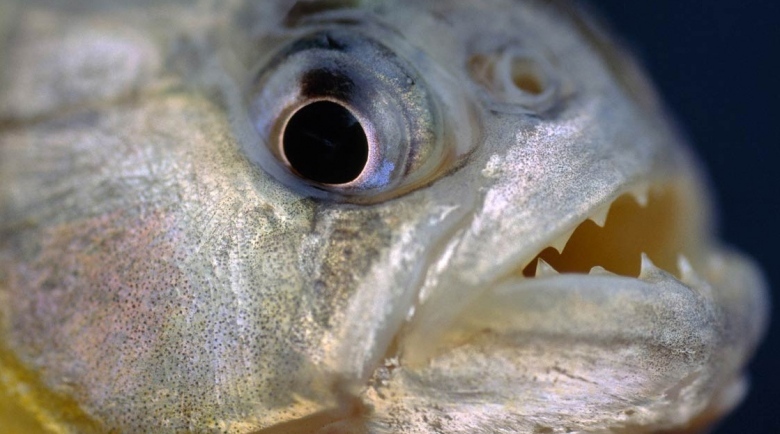 Here’s a question – if piranhas are so ferocious and will attack anything, why aren’t they the only fish in the Amazon? Well, in some cases, it’s because other fish possess bite-proof armor. The 300-pound (136-kg) Arapaima is just such a fish. In the dry season, when water levels get low, Arapaima are forced to share relatively small bodies of water with piranhas. Their tough-but-flexible scales, however, allow them to remain unharmed. A scientist from the University of California, San Diego is now taking a closer look at those scales, with an eye towards applying their secrets to human technology such as body armor. Mechanical and aerospace engineering professor Marc Meyers first became interested in the Arapaima on an expedition to the Amazon basin, several years ago. Now, he has an Arapaima scale-testing rig set up in his UC San Diego lab. The device is not unlike an industrial-strength hole punch, with piranha teeth mounted on the top, which are pressed down into Arapaima scales on the bottom – the scales are laid over soft rubber, to simulate the fish’s underlying flesh. Upon first examining the scales, they were found to have a hard mineralized outer coating, with a layer of softer, more flexible collagen fibers underneath. Using his device, Meyers found that while the teeth could partially penetrate that outer coating, they cracked before they could penetrate all the way through the inner layer. This was apparently because the fibers in that layer are stacked in alternating directions (like the wood chips in plywood), thus spreading the bite force out instead of allowing it to squeeze through.